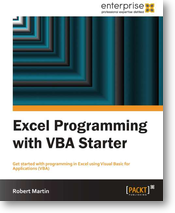 This page lists some of the Excel (VBA) books I like. John Walkenbach asked me whether I could help him to update this book to the 2007 version of Excel, because he was so busy doing the same for all of his other books. Of course I was honoured to do so. This was my first experience writing a book and I must say I enjoyed it a lot. Title: Excel 2007 VBA Programming for Dummies. An excellent work on how to work with the new Office 2007 ribbon, both from the user perspective and from the developer's. If you want to get up to speed on how you make the new Office Ribbon do what YOU want, get this book! A very nice booklet for everyone who wants to jumpstart VBA programming and does not have time to wade through a 1000 page book. I have seen also EXCEL 2007 power programming with VBA. Author John Walkenbach. Now i see another one "Excel 2007 VBA programming for dummies written by the same author. Which one is good for a beginner. I bought so far two books but they are not really what i am looking for. I'd start with the Dummies book. I chekced my dictionary, the word "Dummies" does not look nice :). Great i will go for it.